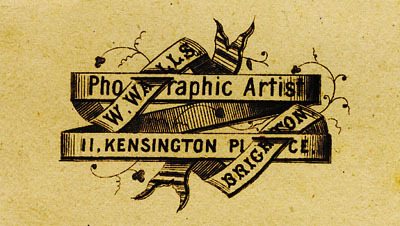 The photographic portrait studio at No.11 Kensington Place, Brighton, was established by William Walls around 1868. 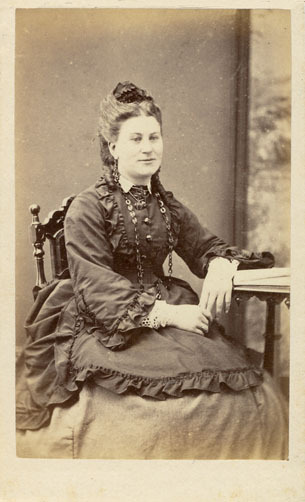 After the death of William Walls in 1873, the photography business passed to his widow Mrs Rosetta Jane Walls, who continued to operate the business under the name of her late husband until about 1877. 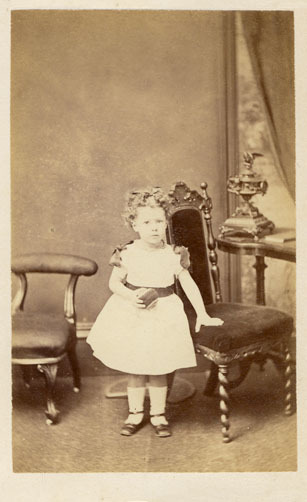 Rosetta Jane Walls was later joined in the business by photographer William Henry Hilton and after 1877, the studio went under the name of Walls & Co.
[ABOVE] Portrait of a young girl in a white dress, photographed by William Walls of 11 Kensington Place, Brighton (c1873). Negative No.6,808. 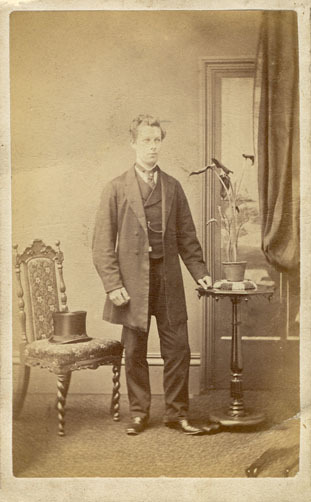 [ABOVE] A portrait of an unknown man, photographed by William Walls of 11 Kensington Place, Brighton (c1869). One of a pair of carte-de-visite portraits featuring a married couple. Negative No.338. 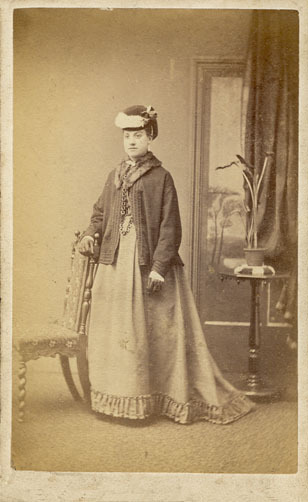 [ABOVE] A portrait of an unknown woman, photographed by William Walls of 11 Kensington Place, Brighton (c1869). One of a pair of cdvs featuring a married couple. Negative No.339. 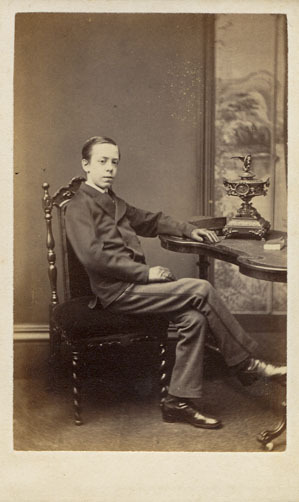 [ABOVE] Portrait of a seated lad, photographed by William Walls of 11 Kensington Place, Brighton (c1873). Negative No.6,067. 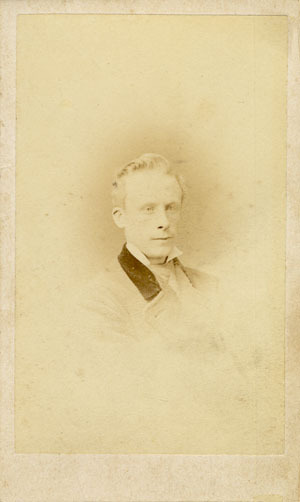 [ABOVE] A vignette portrait of a blonde-haired man, photographed at the studio of W. Walls (proprietor Mrs Rosetta. J. Walls), 11 Kensington Place (c1874). Negative No.8,718. 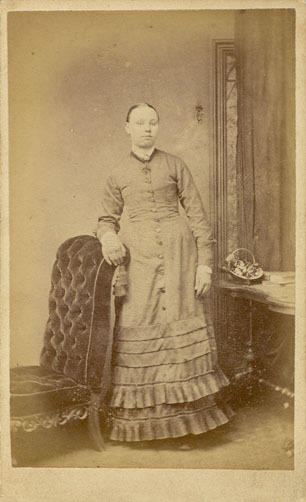 [ABOVE] Portrait of a seated woman, photographed by William Walls of 11 Kensington Place, Brighton (c1872). Negative No.4,013. 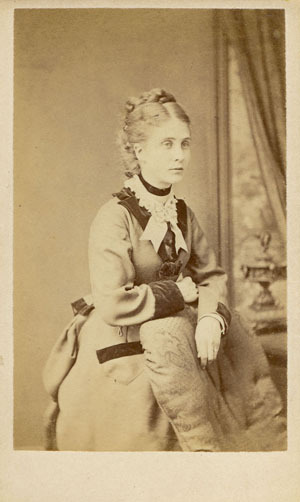 [ABOVE] Portrait of a young woman leaning on a chair, photographed at the studio of W. Walls (proprietor Mrs Rosetta. J. Walls), 11 Kensington Place, Brighton (c1874). Negative No. 7,128. 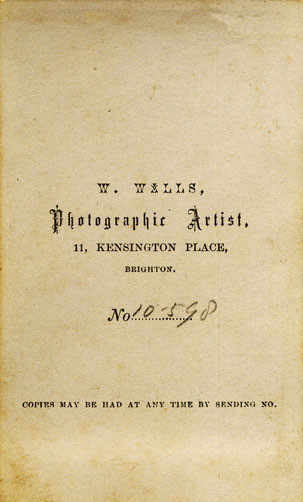 [ABOVE] The trade plate of William Walls, Photographic Artist of 11 Kensington Place, Brighton, taken from the reverse of a carte-de-visite (c1874). Negative No.7,128. 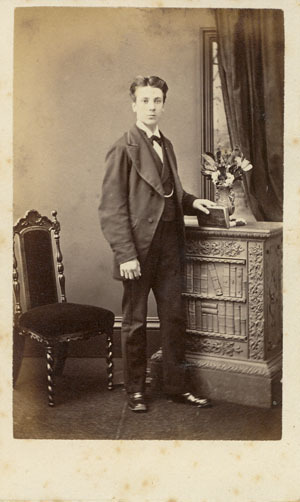 [ABOVE] Portrait of a young man standing by a fake bookcase, photographed by William Walls of 11 Kensington Place, Brighton (c1872). Negative No. 4,795. [ABOVE] A full-length portrait of a young woman leaning on a chair, photographed at the studio of W. Walls (proprietor Mrs Rosetta. J. Walls), 11 Kensington Place, Brighton (c1874). Negative No. 7,879. 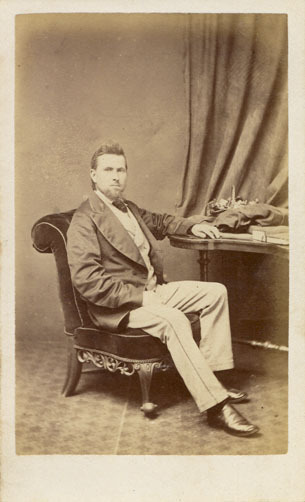 [ABOVE] Portrait of a seated man, photographed at the studio of W. Walls (proprietor Mrs Rosetta. J. Walls), 11 Kensington Place, Brighton (c1875). Negative No.11,305. [ABOVE] The trade plate of W. Walls, Photographic Artist (proprietor Mrs Rosetta. J. 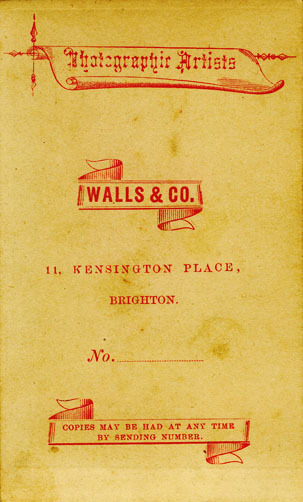 Walls), 11 Kensington Place, Brighton, taken from the reverse of a carte-de-visite (c1875). Negative No.10,598. 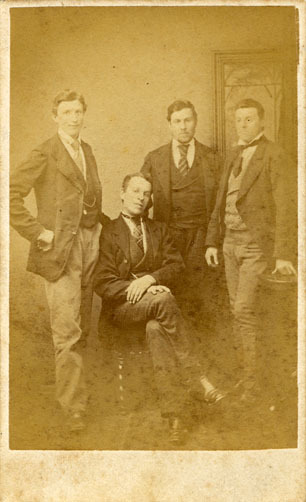 [ABOVE] A group portrait of four young men, photographed at the studio of W. Walls (proprietor Mrs Rosetta. J. Walls), 11 Kensington Place, Brighton (c1875). Negative No.11,612. 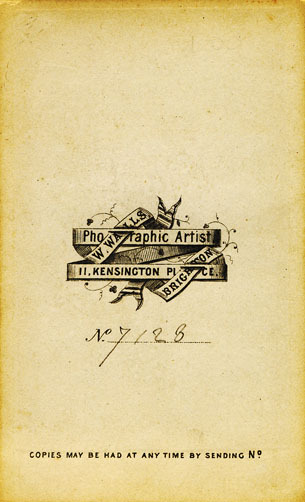 [ABOVE] The trade plate of W. Walls of 11 Kensington Place, Brighton, take from the reverse of a carte-de-visite (c1876). By this date, the studio was being run by Mrs Rosetta Jane Walls, possibly with the assistance of photographer William Henry Hilton. 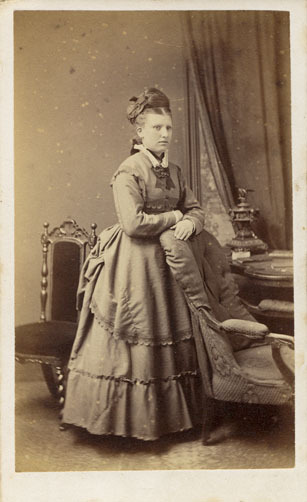 [ABOVE] A full-length portrait of a young woman leaning on a chair, photographed at the studio of W. Walls (proprietor Mrs Rosetta. J. Walls), 11 Kensington Place, Brighton (c1876). Negative No. 12,461.